The ages of children in child care has been summarised as shown in Table 1. (Australian Bureau of Statistics, 2012) Table 1 Children aged 0-12 years, Type of care usually attended by age of child-Western Australia. This can be more easily illustrated in Graph 1. As we can see from Graph 1, most children are aged from 2 up to and including 3 years of age. With a big drop off after 6 years when children are attending full time primary school. 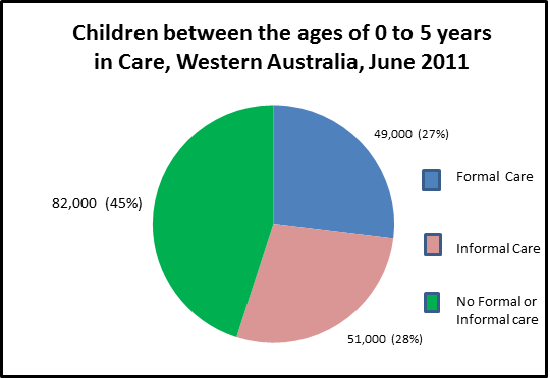 The percentage of children between 0 to 5 years in formal child care in the population of Western Australia. 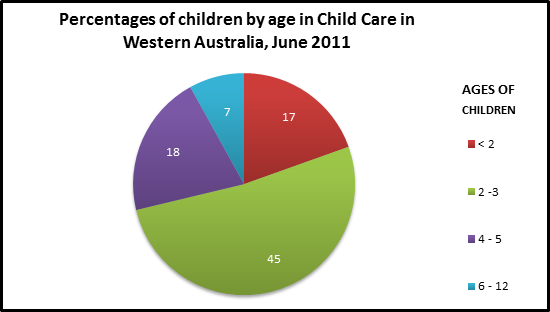 Again looking at Table1, we can see that for children aged between 0 to 5 years in the Western Australian population, only 27% actually use formal child care centres. - Informal Care means the children are cared for by a grandparent other relative, sibling or other adult. - No Formal or Informal care, children are in care of one of their parents. How does this relate to our child care centre at ECU. There are several sources of potential customers that may be interested in using our child care service. 1. The people in close proximity to the centres location at ECU. 2. People from further a field that may have to travel closer into Bunbury city centre for work. 3. And the people who are attending Edith Cowan University. The demand and supply of child care placements in formal child care in the Shire of Bunbury and the Greater Bunbury Area. To obtain the information on child care we take the statistics for the whole of Western Australia and use the percentages to estimate child care in these areas based on their population. We are then able to estimate the potential demand for child care placements as well as the current and future supply of placements. Includes the area from Victoria Heights south to Picton and across to Usher, College Grove and Withers. Includes the Shire of Bunbury, Australind, Leschenault, Eaton, Gelorup, Dalyellup and Stratham. Finding the percentage of children in the ages 0 to 5 years from the Shire of Bunbury, then allows us to estimate the number of children in the Greater Bunbury Area. Ages 0 to 5 years: 70,037 × 7.3% = 5,143 children. The estimated number of child care placements needed currently in the population of the Shire of Bunbury and the Greater Bunbury Area. TABLE 2: Ratio of children (0 to 5 years) to child care centres in 2011. The South West Development Commission (SWDC) administers an area roughly from the Greater Bunbury Area down to Walpole on the south coast and all land westwards from there. Statistics from the South West Development Commission have indicated that over the next ten years the number of people in the South West Area will grow from approximately 165,900 in 2011 to 208,500 in 2021 (“Population (Population Growth),”n.d. ), an approximate 25% increase in population. From this information we can get an estimate of what the population growth will be like for the Greater Bunbury Area. TABLE 3: Ratio of children (0 to 5 years) to child care centres in 2021. In the market area that our proposed child care centre at Edith Cowan University will service, we currently estimate that there is an undersupply of child care placements to cater to the potential demands in this market area. Most child care centres have approximately 15 to 30 children in their care. With our ratios of 46 children per child care centre in the Shire of Bunbury and 69 children per child care centre in the Greater Bunbury Area, we can conclude that these demands are currently not being met by the market. The demand for more child care centre placements will only continue to grow quite quickly from now the 2021. With future growth in the Greater Bunbury Area of an estimated 25%, population will increase by 17,950 people. We can see that for children aged between 0 to 5 years this means an estimated increase of 1310 children (17,950 × 7.3%) in the population to a total of 6,423 children. Of the 6,423 children aged from 0 to 5 years, 1,734 will require the services of a child care centre bringing the ratio of children to child care centre to 87 children between the ages of 0 to 5 years requiring the services of a child care centre.